Jamie Langfield has backed former club Aberdeen to run Celtic closer this season in the Scottish title race. The goalkeeper played for the runners-up who earned praise before Celtic won last term's title with three games left, eventually winning by 17 points. "Aberdeen have more steel about them this season and I think it will be a lot closer than it was last season," Langfield told BBC Scotland. "They are playing with a swagger that I've not seen before." Langfield, who was released this summer after 10 years at Pittodrie and joined Scottish Championship outfit St Mirren, has predicted that Robbie Nielson's promoted Hearts will finish third. "Hearts have started really well, but we can't really get carried away just now and I think Robbie will tell you that as well," said the 35-year-old. "If you look at the likes of Hamilton, who came up last year, they started the season really well and were top of the league as well but started to fall away as the season went on. "I think Aberdeen and Hearts will run Celtic very close, especially Aberdeen." However, Langfield believes that Celtic, who lie second behind Hearts with the Dons in third following Saturday's games, will still secure their fifth consecutive title. "Being an ex-Aberdeen player, I would absolutely love to see them be number one this year, but I think Celtic have just got too much in the tank," he said. 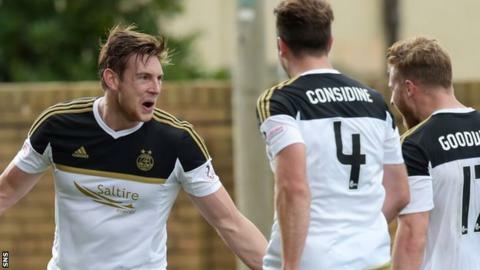 "I hope Hearts - and Dundee as well - can do Aberdeen a favour and take points off Celtic. "I'd love it for someone else to win the league this season, but I can't see it happening." The major difference between Celtic and Aberdeen last season was the failure of Derek McInnes's side to take even a point from their four meetings last season. "I definitely believe Aberdeen will take points off of Celtic, especially at Pittodrie," added Langfield. "I think Derek has gone for squad rotation and, where he only had 12-13 starters, now there's possibly 15-16 and he can afford to take players out, give them a rest and re-charge their batteries. "Every position, they've got two Premiership players there and I think they'll be a lot stronger this season."